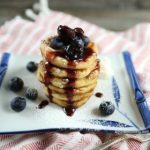 Syrniki are traditional Ukrainian cheese pancakes that are usually made from a curdled milk kind of cheese, such as farmers cheese. The creamy semi-sweet cheese filling and slightly crispy and fluffy exterior are what makes these so delicious and a well known favorite among the Slavic culture. Combine the cheese, eggs, salt, baking powder, sour cream and granulated sugar; add 1 cup of flour and mix well to combine. 2. 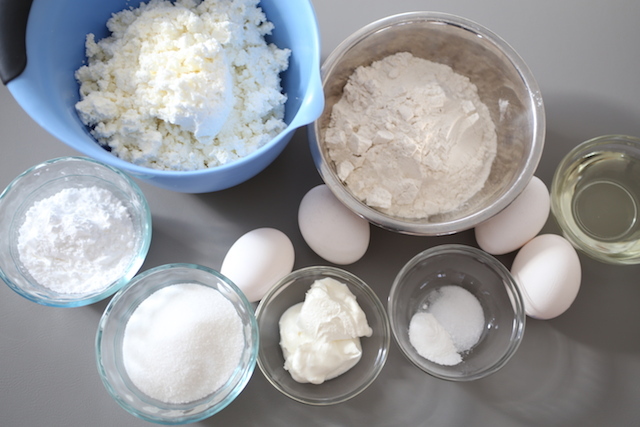 Place the other 1 cup of flour into a shallow bowl or dish; set aside. 3. Make about 1 inch balls from the cheese mixture and dredge into the flour. Shape balls into disks and place onto a well floured surface. 4. Preheat a medium sized non-stick skillet with 13 tbsp of oil over medium-low heat. Note: Cheese pancakes can brown easily due to the fragile texture so be sure to keep the frying temperature at a low setting. 5. Fry syrniki a few minutes on each side working in small batches. 6. Place fried syrniki onto paper towels and continue to work with the remaining dough. 7. Dust warm syrniki with powdered sugar and serve with fresh fruits and sour cream, if desired. Place the other 1 cup of flour into a shallow bowl or dish; set aside. Make about 1 inch balls from the cheese mixture and dredge into the flour. Shape balls into disks and place onto a well floured surface. Preheat a medium sized non-stick skillet with 13 tbsp of oil over medium-low heat. Note: Cheese pancakes can brown easily due to the fragile texture so be sure to keep the frying temperature at a low setting. Fry syrniki a few minutes on each side working in small batches. Place fried syrniki onto paper towels and continue to work with the remaining dough. Dust warm syrniki with powdered sugar and serve with fresh fruits and sour cream, if desired. Can you tell me how many people this recipe serves? It makes 47 little pancakes. Thanks I made these cute pancakes. However I needed more flour to make my dough.